"THE FUTURE IS RIDING ON METRO"
Never had I ever read such a prescient message as the one stamped at the bottom of my rail-ticket receipt. It was Oct. 27, and I had just bought a SmarTrip card at the Metrorail's Reagan Airport station in Washington, D.C., and was on my way to a big conference about the benefits and problems that ensue when a new commuter train comes to town. I was in D.C. to report how the conference's findings might intersect with the Sonoma Marin Area Rail Transit system that's been running up and down the North Bay for the past year, with lots of questions buzzing around about what it will mean for the region moving forward. In linking Santa Rosa with San Rafael, can SMART be seen as an arbiter of what's to come for a region crippled by an ongoing absence of affordable housing? Alas, yes. I have a personal and professional affinity for train travel. I was, ten years ago, an intern at the Central Japan Railway Company (aka JR Central). One of JR Central's subsidiaries, Nippon Sharyo, performed the final assembly of SMART's rolling stock at its Illinois plant. JR Central was hosting a reunion event in the nation's capital for all former interns, and I was invited to the all-expense-paid junket. The event included a conference at K&L Gates—the law firm that represents JR Central domestically—followed by a reception at the swank St. Regis hotel. 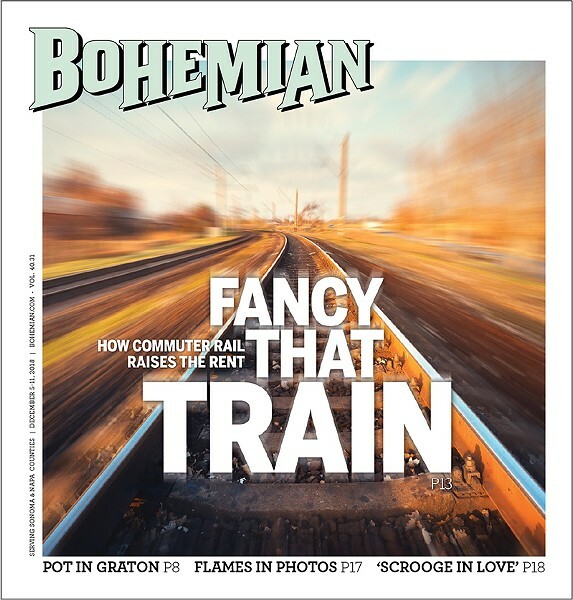 I hopped on a plane to learn more about how JR Central's business might affect train travel moving forward for SMART—well, especially for millennial SMART riders of the scrappy freelancer variety, who can barely afford to live in the North Bay as it is, but who love to ride the train whenever possible. There was the big takeaway from the Washington conference. For all the talk of "transit-oriented development" in the North Bay, for all the civic concern about affordable housing, workforce housing, tiny homes, rent control and etc., the research points in one direction when it comes to commuter trains: they drive up real-estate prices in regions where they've been built. It's no fault of the train systems, of course, and SMART faces its own affordable-housing problem as a company in need of a reliable, and preferably local, workforce that it can retain. "There are many instances of transit-oriented [development] nationwide that include affordable housing," says SMART spokeswoman Jeanne Mariani-Belding via email. "Those land-use issues typically rest with local jurisdictions. Businesses throughout the North Bay, including SMART, are feeling the effects of the lack of affordable housing and the challenges that creates in terms of hiring and retaining people." SMART has been rolling along for just over a year, offering lots of discounts and fairly priced monthly passes for commuters, and when I took my parents on the green machines this August, plenty of riders were traveling north to and from San Rafael, for work and fun. Despite a few notable collisions involving pedestrians and trucks, the much-delayed SMART rollout has been a success, and a net positive for the region. But the success may also herald a less-than-desirable new challenge for North Bay residents. When the commuter rail comes to a region, the price of housing tends to go up, and then up some more. That's a critical issue for a region that is struggling mightily to square up its housing scene to sync with the promise of a 21st-century SMART rail system that's accessible and affordable to all. It was a cold, blustery day in the nation's capital that suggested a harsh winter was right around the corner. The White House was a sad sight with all the extra security and barricades that extended 70 feet from the main wrought-iron fence, to say nothing of its occupant. Circling back around to K&L Gates, I stepped into a conference room full of JR Central employees, former interns and my Japanese-American relations professor from Vanderbilt, James Auer. He made it possible for students like me to participate in the internship. After a few minutes of greetings, we sat at our assigned seats to find materials detailing JR Central's latest advancements in maglev technology, and the company's impressive growth in the decade since I interned. The first speaker was deputy general manager Rikuhei Daimon, who organized the reunion. Telling us that we would always be members of the JR Central family, he introduced Masahiro Nakayama, JR Central's general manager in the United States. Nakayama filled our heads with visions of the N700S Shinkansen, the train model that in the near future will connect Dallas and Houston in 90 high-speed minutes. Neat. The most eye-opening talk—and the one that's very relevant to North Bay residents—was given by rail researcher Mike Schlicting, a former JR Central intern and a current doctoral student at the University of Wisconsin in Madison.